Friday was Mexican Pizza day on the “Tex-Mex Week” menu and it was awesome! First of all, here is another meal where everyone gets to express their creativity or, depending on personality type, maintain creative control. This ensures everyone eats and everyone likes what they eat or at the very least everyone is responsible for their liking and/or not liking of what they make. Shall I over explain some more? Fourthly, (yeah I’m going with that) the pizzas turned out to be some of the yummiest on record at Chez Peady. Here, have a look! Uh oh! Now we’re getting jalapeño business Mr. Jalapeño! Here are all the seeds and pith. You can tell I removed a lot! Perfect red pepper from Pete’s! Freshness is always a great pizza topping. Why are red peppers always so happy? Here’s a La Tortilla Factory Olive Oil tortilla with 12 g of fibre. Pizza night’s are great nights to use up leftovers. This is burrito filling. Delicious. Not too hot. Not too chunky. Worked great as sauce for the pizzas. Not pretty. Not soft. Not perfect. But! Gluten free pizza crust! Red onions are cool, aren’t they? Can you see me through that?! Big ol’ mess of onions! Frozen corn. Always on hand for moments such as these. Thing 1’s pizza. See the jalapeños? Thing 2’s pizza is smiling. On purpose. Thing 1 is very specific about his pizza eating. MINE!! Mine all mine and I’m not sharing! The risks I will take for you readers! HOT! Can’t you almost taste it? I try to make my food pretty. Also, even. Don’t judge. Thing 2 chose this as his “treat”. Yup. Hee hee hee hee. Yes. I believe those were his exact words. Shock at his mother’s lack of judgement. Boxed Burritos! *gasp* Nooo! Well, um. Yes, actually. It’s okay. We will fancy it up! Yup. Those are chickpeas being added to the burrito filling. Yum. Adding healthy is always a nice choice! All mixed in. No one will even notice, right? Romaine lettuce “hearts”. This was some of the best lettuce we have ever had. So fresh! Tomatoes all sliced and ready to go. It was a two box night. It was also delicious. Never fails. Worth a try! Filling all ready to go. The chickpeas absorbed lots of flavour. Soft tortillas for the burritos. They are very good according to the tortilla eaters. Always lemon in the water. Always. It was really all for this. Boxes and all. Because everyone should get what they like best sometimes. Huevos Rancheros – It’s like Brinner in a sombrero! Last night was Huevos Rancheros night on the “Tex-Mex Week” menu and it went even better than expected. Breakfast for dinner, or “Brinner”, is always a popular meal at Chez Peady and it (conveniently) seems to fall, most often, mid-week, which is exactly when I need the break – and I mean I need a break, fast (Hah!) – of a simple supper. Since it is Tex-Mex Week, and on a Wednesday, Huevos Rancheros was the logical choice! Now there are a lot of really fancy ways* to make this extremely simple dish, but remember that break I needed… yes, I had places to go and people to see. In fact there was an especially good reason for me to choose a simple and speedy approach to last night’s dinner. There was a thing at a place with some stuff** and well, I had to be there – on time! Not surprisingly, Thing 1 and Thing 2 tried everything, anyway. Thing 1 *loves* this meal. There were lots of spicy, bold flavours and that’s what he enjoys. Thing 2 tried the Chorizo and decided it was a tad too hot for her taste, but piled on lots of fresh tomato. So, it’s really just another case of “To each, his/her own”. In the end, everyone was full, happy, and I wasn’t too late for my thing. Here is what it all looked like! Delicious Chorizo Sausage from Pete’s Frootique in Bedford, N.S. I baked them at 400 degrees until done. There is something wrong with these eggs! Wait. No. These are Roma tomatoes! Whew! Sliced Romas ready to be added to the creations at the dinner table. You know what they say? If you want to make Huevos Rancheros, you’re gonna have to break a few eggs! Or something like that. Eggs meet fork. Break them all up, but not too crazy fluffy. Add a shot of cream. Yes. Cream. Seasoning is crucial. Freshly cracked black pepper, onion powder (I know. I know. ), and a little heat. This is Fajita seasoning. Scrambled huevos! Easy peasy on a busy night. Which one is ready to use? Can you tell? This one is *nearly* ready, but not quite. The nice green colour where the stem was, though? That is the sign of a beautiful Avocado. The darker skinned one was perfection! See? Isn’t that easy? No avocado fingers, either. Which, really, I was conflicted about. The Chorizo turned out great! I know lots of people would cook it a different way, but this worked for me. This is the spread. There were warmed tortillas folded into triangles on the tortilla eaters’ plates with their eggs. I sliced the Chorizo so everyone could take as little or as much as they’d like. Thing 2 took three slices and then smoke came out of her ears and she whistled – cartoon style – and then she offered two slices to Daddy-O! Here is *my* portion of Huevos Rancheros. Lots of Chipotle Tabasco and Red Pepper flakes. Muy caliente! Note, I am tortilla-less. Mine was awful! Can you tell? Please excuse me, while I lick my blog. Thing 1 loved his and made a brinner burrito, of sorts. Thing 2 is not a big fan of eggs, but she likes “scrambled”. Her brinner burrito was filled with avocado and tomatoes! Orange Juice is the perfect beverage for this meal. At Chez Peady, BB is always invited. Huevos Rancheros Wednesday was wonderful! Have you ever had Huevos Rancheros? Do you enjoy breakfast for dinner? Do you call it “Brinner”? What is your go-to breakfast for dinner? What would be on your ideal breakfast for dinner menu? *Like this, this, this or this! **I had to be at an event at Thing 2’s school at 7 to hear a talk given by a person who has helped Thing 1 immensely. I was *not* going to miss it! Tex-Mex Week is in full swing at Chez Peady and as you may already know, Monday’s Fajita Fiesta was fabulous. In keeping with our theme, Tostada Tuesday was terrific. Do you know what a tostada is? Have you ever had a tostada? Oh, you are in for a treat! Honestly, it is a thing of joy. Here, let me just show you. Water with lemon is the perfect accompaniment. It’s better with lime, but have you seen the price of limes?! Yikes! Authentic Tostadas all the way from Mexico! Authenticity is always a tasty ingredient! Chicken, baked on Monday, ready for Tuesday! That’s no pollo loco! Roma tomatoes. Trust me. So good! Freshly diced tomatoes (rough chop, will do!). Romaine lettuce. Serrated edge knife. Happiness! See how nice and thinly sliced the lettuce is? This is no time for giant hunks of Romaine. Thing 1 loves Tex-Mex Week. Can you tell? Tostadas! Chipotle on the left. Plain on the right. Both scrumptious! Thing one applying his refried beans. Thing 2 made a bit of a Tostada Salad after her first one exploded. This is the sign of a “hit”. It is an easy, delicious meal and can be customized to individual tastes. I love that Thing 1 & Thing 2 can make their own. Kids make pretty good choices when left to their own devices. They can be as creative as they wish! Don’t you just love that? Tell me, will you give Tostadas a try? I hope you will. And now, as promised, I give you your bonus song*. *Okay. Okay. It’s a mind worm. I admit it, but my Things were just playing it and it seemed fitting! It’s “Tex-Mex Week” at Chez Peady and so far, it’s been muy perfecto. We started our week with Cinco de Mayo (Isn’t that timely?) on Monday. It was “Fajitas ‘n’ Fixin’s” night. Always a hit! Here’s a little peek at our dinner! Everything begins with a Spanish onion and green pepper sautéed in some EVOO. This immediately starts the “mmm”s and “What’s on the menu?”s from Thing 1 & Thing 2. Time to make some “Shreddar Cheese”. That’s a nice medium Cheddar. Sometimes we use a Marble Cheddar (Thing 2’s favourite!). Yummy! Shredded cheese. At this point little hands start arriving to “test” the goods. Can you blame them? Mmmm. Cheeeesey! Shred the chicken slightly and add back to the sautéed veggies to get everything all yummy. Note, I keep them together, but separate. This is so those with green pepper aversions can avoid them if need be. At this point a little sprinkle of seasoning is a great idea. Epicure Fajita is great, but you can make your own! This is my tortilla-less fajita. These are some of our favourite toppings. Guacamole (Yucatan), Sour Cream, Salsa (Sabra makes a great “Southwest” version), “Shreddar” cheese. Here are Daddy-O’s fajitas before being dressed. Here is my meal. I did add a bit of “Shreddar”, too! Scrumptious! If you take a closer look at my photos, they will reveal last night’s recipe. 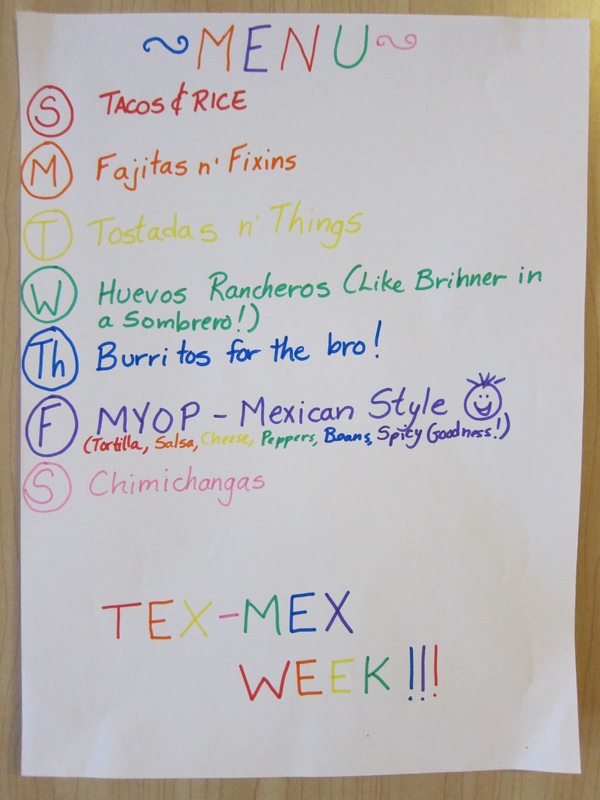 Over the next week, I plan on sharing our “Tex-Mex Week” meals and the recipes I use. If you have any questions, please don’t hesitate to ask. I’m all about the sharing! Did you celebrate Cinco de Mayo? Do you enjoy flavours inspired by Mexico? What is your favourite meal? What is your favourite cuisine?